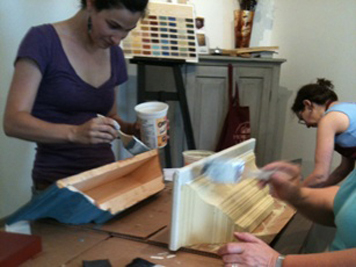 Taking our hands on Milk Paint Finishing Workshop will ensure that you acquire a strong knowledge of how to use our Milk Paint products, stains and natural finishing oils. During this day course, you will complete a small bookshelf that is provided for you, to be taken home to display your new talents! Different uses of Milk Paints on wood, ceramic, metal, drywall etc. Faux-finishing techniques, antiquing, distressing etc. Having trouble deciding on what colours to choose? Hiring a professional colour consultant from Homestead House will help you choose the colours that truly express and reflect your sense of style, making your place as unique as you are. Please contact us for an appointment. Our experienced team of professional painters provide you and your family with a superior level of craftsmanship while paying great attention to detail. Our experienced painters have extensive experience with natural plaster application, clay application, Milk Paint application as well as the conventional Zero VOC Interior line of paints. Our painters are sure to leave you exceptionally pleased helping you create a unique atmosphere in your home while using toxic free paints. For more information or a quote please contact us. 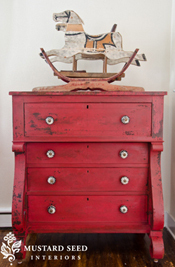 Have an old piece of furniture lying around the house that needs a make over? Don't have the time to paint it yourself and give it new life? 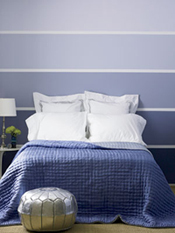 We now offer a painting service using only our non toxic milk paints and finishes. Enquire about our in store painting services via email or phone! Or bring a friend option and save!